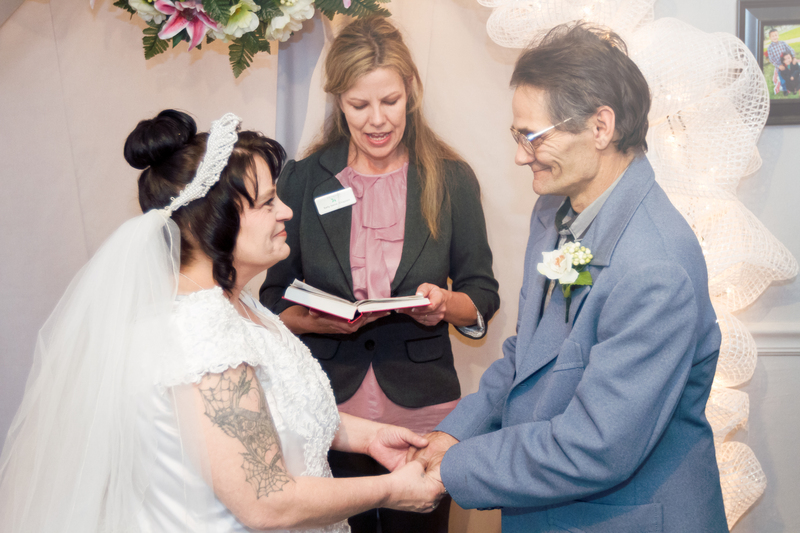 Mark and Karen on their wedding day, with Hospice Care Plus chaplain Sally Iseral officiating. Photo courtesy of Shimmer and Shine Photo. One February day in 2014, we made a special request on our Facebook page: did anyone have a sized 32-34 suit or tux we could borrow for a patient who wanted to get married? We asked our Facebook followers because the patient’s care team—the nurse, social worker, nurse aid, and chaplain—had all checked with friends and family, and they couldn’t find a suit in the right size. Their patient, Mark, wanted to marry Karen, his girlfriend of 8 years, before he died. It was very important to both of them. Since the care we offer is all centered on the wishes and hopes of the patient, well—we had to make it happen. It actually isn’t uncommon. We’ve helped with many weddings in our 33 years. What isn’t common, though, is to have 20,000 people follow the story and ask how they could help. Yep—that’s how many Facebook users watched our page for more news about Mark and Karen. Many of them commented, messaged, or called to offer their help. The suit was taken care of within minutes, but our Facebook fans wanted more for this couple. 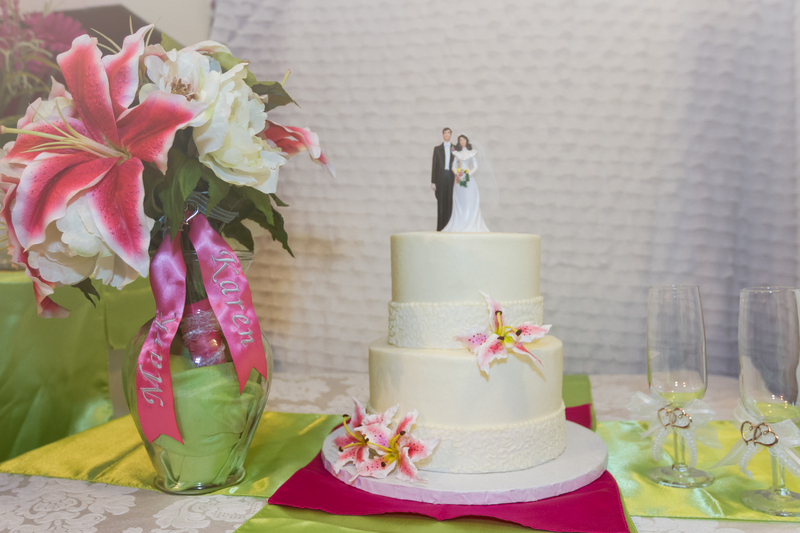 Within a few days, various businesses and individuals had offered everything from a professional wedding cake and bouquet to reception refreshments, decorations, and photography (the complete list is at the end of this entry). Sally Iseral, our chaplain and the person who conducted the wedding, had several meetings with Mark and Karen to plan their ceremony. At one meeting, after the Facebook post, Mark had not been very well. 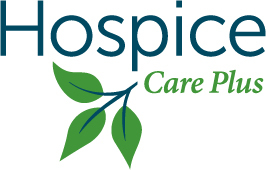 Though we’d been providing what we call Crisis Intervention Care–8 to 12 hour shifts of in-home nursing care when a patient’s symptoms require more intense care– Karen was still exhausted from checking on him night and day. And he, of course, had been very sick. So, neither of them was aware of the outpouring of support for them on Facebook. The donated bouquet and wedding cake. Photo courtesy of Shimmer and Shine Photo. They asked if we’d show them, so we did. Mark’s eyesight wasn’t good at that point, and Karen was so tired she could barely read the computer screen. So, Mark sat in a chair and Karen stood behind him as one of our staff read the status updates and comments out loud. When we got to the update about the “anonymous biker” who drove all the way from Jackson County to our Berea office—on his bike, in February—to give us some hard-earned cash, and to tell us to “make sure that boy has a good wedding,” I heard a sob. When we turned around, Mark had pulled Karen into his lap and was crying into her shoulder. They stayed there for the longest time, quietly crying together. She cradled his head in her arms and he held on to her with every ounce of energy he had left in his fragile body. They were so truly overwhelmed by the love and generosity shown to them, that they could do nothing more than weep and hold onto one another. 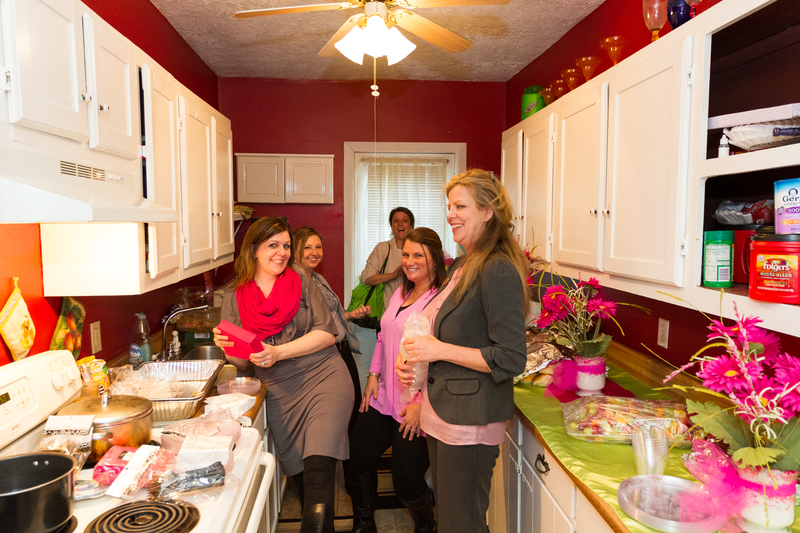 A few of the helpers who volunteered to help prepare refreshments and decorations. Photo courtesy of Shimmer and Shine Photo. If you aren’t familiar with the story of Mark and Karen, you’ll find the posts, including wedding photos and more, in the February-March 2014 section of our Facebook page. Their wedding was beautiful, and, thanks to all that excellent care, he looked and felt better than he had in ages. Here’s the list of businesses and individuals who contributed to the wedding. They—and every single person who commented on the posts—have our deepest gratitude. A custom wedding cake and topper, donated by Doodlebug Cakes, Berea, Ky.
A custom, keepsake bridal bouquet, boutonnière, and locket by Amy Powers Baker, Berea, Ky.
Florals for the bouquet, donated by Michael’s in Richmond, Ky.
Special clothes for the mother-of-the-bride, donated by Cool Thread Fashions in Beattyville, Ky.
Professional wedding photography, including a memory book, by Shimmer and Shine Photo, Richmond, Ky.